This network infrastructure demands high-performance and availability associated with the production of eight hours of live television and four hours of live radio programming in the building each day. It connects the building's central studio, three other broadcast positions around the building, two recording studios, a photography studio and three control rooms and all of BTV's production equipment. This IP data network includes 90+ network nodes, 400+ 40GbE network fabric links, 4,000+ network ports, and 2,000+ live network endpoints connecting at a combination of 10GbE, 40GbE and 100GbE — not to mention a 14 PB video storage system. Given the size of the company's new building in London and the IT infrastructure team's interest in operating a multi-vendor production network, the team sought to simplify the management of this network by deploying a technology solution typically found only in data centers. 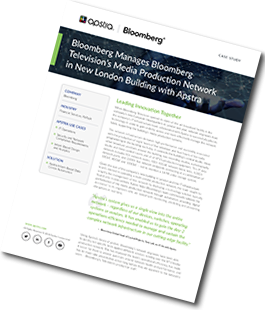 Apstra helps Bloomberg's team continuously validate the performance of the media production network through automation, providing 'digital assistance' to its engineers who are tasked with monitoring, predicting and preventing disruptions in real-time. 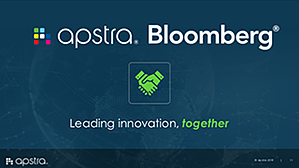 "Apstra's system gives us a single view into the entire media production network - regardless of our devices, switches, operating systems or vendors," said Tony Lott, Global Head of Capital Projects for Bloomberg's IT Infrastructure team. "It has enabled us to gain the day-2 operational efficiency needed to manage and sustain the complex network infrastructure in our cutting-edge media production facility." Using Apstra's library of probes, Bloomberg's network engineers have been able to quickly run specific tests against different services running over the BTV media production network. This has improved the team's operational efficiency, has made it easier for them to answer questions around network health and performance, and has let them take preventative action long before they are apparent to the network's users – Bloomberg Television's production staff. Bloomberg Television is Bloomberg Media’s global business and financial television network, available in more than 437 million households worldwide. Bloomberg Television is also delivered to the Bloomberg Terminal, which guides the world’s financial elite with indispensable real-time data, news, and analysis. The network streams live on Bloomberg’s digital and mobile properties, along with Apple TV, Amazon Fire TV, Android TV, Samsung TV and Roku. Business transformation is driving the mandate for data center infrastructure transformation. IT leadership is requiring cloudification of operations, increased reliability, and reduced costs while IT clients are demanding a cloud-like experience, simplified operations, and lower DevOps costs. Apstra Intent-Based Data Center Automation meets all of these demands and enables businesses to build a data center that increases application reliability and availability by automating and simplifying deployments and operations, and reducing OpEx and CapEx costs. Download this presentation on Intent-Based Data Center Automation to learn more about the Bloomberg Customer Deployment Story.